For other uses, see Vitamin (disambiguation). The term vitamin is derived from the word vitamine, coined in 1912 by Polish biochemist Casimir Funk, who isolated a complex of micronutrients essential to life, all of which he presumed to be amines. When this presumption was later determined not to be true, the "e" was dropped from the name. All vitamins were discovered (identified) between 1913 and 1948. Vitamins are classified as either water-soluble or fat-soluble. In humans there are 13 vitamins: 4 fat-soluble (A, D, E, and K) and 9 water-soluble (8 B vitamins and vitamin C). Water-soluble vitamins dissolve easily in water and, in general, are readily excreted from the body, to the degree that urinary output is a strong predictor of vitamin consumption. Because they are not as readily stored, more consistent intake is important. Fat-soluble vitamins are absorbed through the intestinal tract with the help of lipids (fats). Vitamins A and D can accumulate in the body, which can result in dangerous hypervitaminosis. Fat-soluble vitamin deficiency due to malabsorption is of particular significance in cystic fibrosis. Anti-vitamins are chemical compounds that inhibit the absorption or actions of vitamins. For example, avidin is a protein in raw egg whites that inhibits the absorption of biotin; it is deactivated by cooking. Pyrithiamine, a synthetic compound, has a molecular structure similar to thiamine, vitamin B1, and inhibits the enzymes that use thiamine. Vitamins are essential for the normal growth and development of a multicellular organism. Using the genetic blueprint inherited from its parents, a fetus develops from the nutrients it absorbs. It requires certain vitamins and minerals to be present at certain times. These nutrients facilitate the chemical reactions that produce among other things, skin, bone, and muscle. If there is serious deficiency in one or more of these nutrients, a child may develop a deficiency disease. Even minor deficiencies may cause permanent damage. Once growth and development are completed, vitamins remain essential nutrients for the healthy maintenance of the cells, tissues, and organs that make up a multicellular organism; they also enable a multicellular life form to efficiently use chemical energy provided by food it eats, and to help process the proteins, carbohydrates, and fats required for cellular respiration. 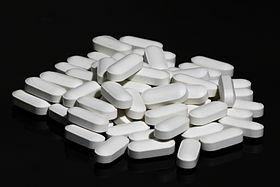 For the most part, vitamins are obtained from the diet, but some are acquired by other means: for example, microorganisms in the gut flora produce vitamin K and biotin; and one form of vitamin D is synthesized in skin cells when they are exposed to a certain wavelength of ultraviolet light present in sunlight. Humans can produce some vitamins from precursors they consume: for example, vitamin A is synthesized from beta carotene; and niacin is synthesized from the amino acid tryptophan. The Food Fortification Initiative lists countries which have mandatory fortification programs for vitamins folic acid, niacin, vitamin A and vitamins B1, B2 and B12. The body's stores for different vitamins vary widely; vitamins A, D, and B12 are stored in significant amounts, mainly in the liver, and an adult's diet may be deficient in vitamins A and D for many months and B12 in some cases for years, before developing a deficiency condition. However, vitamin B3 (niacin and niacinamide) is not stored in significant amounts, so stores may last only a couple of weeks. For vitamin C, the first symptoms of scurvy in experimental studies of complete vitamin C deprivation in humans have varied widely, from a month to more than six months, depending on previous dietary history that determined body stores. Deficiencies of vitamins are classified as either primary or secondary. A primary deficiency occurs when an organism does not get enough of the vitamin in its food. A secondary deficiency may be due to an underlying disorder that prevents or limits the absorption or use of the vitamin, due to a "lifestyle factor", such as smoking, excessive alcohol consumption, or the use of medications that interfere with the absorption or use of the vitamin. People who eat a varied diet are unlikely to develop a severe primary vitamin deficiency, but may be consuming less than the recommended amounts; a national food and supplement survey conducted in the US over 2003-2006 reported that over 90% of individuals who did not consume vitamin supplements were found to have inadequate levels of some of the essential vitamins, notably vitamins D and E.
Well-researched human vitamin deficiencies involve thiamine (beriberi), niacin (pellagra), vitamin C (scurvy), folate (neural tube defects) and vitamin D (rickets). In much of the developed world these deficiencies are rare; this is due to A) an adequate supply of food and B) the addition of vitamins to common foods (fortification). In addition to these classical vitamin deficiency diseases, some evidence has also suggested links between vitamin deficiency and a number of different disorders. Some vitamins have documented acute or chronic toxicity at larger intakes, which is referred to as hypertoxicity. The European Union and the governments of several countries have established Tolerable upper intake levels (ULs) for those vitamins which have documented toxicity (see table). The likelihood of consuming too much of any vitamin from food is remote, but excessive intake (vitamin poisoning) from dietary supplements does occur. In 2016, overdose exposure to all formulations of vitamins and multi-vitamin/mineral formulations was reported by 63,931 individuals to the American Association of Poison Control Centers with 72% of these exposures in children under the age of five. In the US, analysis of a national diet and supplement survey reported that about 7% of adult supplement users exceeded the UL for folate and 5% of those older than age 50 years exceeded the UL for vitamin A. The USDA has conducted extensive studies on the percentage losses of various nutrients from different food types and cooking methods. Some vitamins may become more "bio-available" – that is, usable by the body – when foods are cooked. The table below shows whether various vitamins are susceptible to loss from heat—such as heat from boiling, steaming, frying, etc. The effect of cutting vegetables can be seen from exposure to air and light. Water-soluble vitamins such as B and C dissolve into the water when a vegetable is boiled, and are then lost when the water is discarded. In setting human nutrient guidelines, government organizations do not necessarily agree on amounts needed to avoid deficiency or maximum amounts to avoid the risk of toxicity. For example, for vitamin C, recommended intakes range from 40 mg/day in India to 155 mg/day for the European Union. The table below shows U.S. Estimated Average Requirements (EARs) and Recommended Dietary Allowances (RDAs) for vitamins, PRIs for the European Union (same concept as RDAs), followed by what three government organizations deem to be the safe upper intake. RDAs are set higher than EARs to cover people with higher than average needs. Adequate Intakes (AIs) are set when there is not sufficient information to establish EARs and RDAs. Governments are slow to revise information of this nature. For the U.S. values, with the exception of calcium and vitamin D, all of the data date to 1997-2004. EAR US Estimated Average Requirements. RDA US Recommended Dietary Allowances; higher for adults than for children, and may be even higher for women who are pregnant or lactating. AI US and EFSA Adequate Intake; AIs established when there is not sufficient information to set EARs and RDAs. NE EARs have not been established. In those who are otherwise healthy, there is little evidence that supplements have any benefits with respect to cancer or heart disease. Vitamin A and E supplements not only provide no health benefits for generally healthy individuals, but they may increase mortality, though the two large studies that support this conclusion included smokers for whom it was already known that beta-carotene supplements can be harmful. A 2018 meta-analysis found no evidence that intake of vitamin D or calcium for community-dwelling elderly people reduced bone fractures. In Europe are regulations that define limits of vitamin (and mineral) dosages for their safe use as dietary supplements. Most vitamins that are sold as dietary supplements are not supposed to exceed a maximum daily dosage referred to as the tolerable upper intake level (UL). Vitamin products above these regulatory limits are not considered supplements and should be registered as prescription or non-prescription (over-the-counter drugs) due to their potential side effects. The European Union, United States, Japan establish recommended upper intake levels. Most countries place dietary supplements in a special category under the general umbrella of foods, not drugs. As a result, the manufacturer, and not the government, has the responsibility of ensuring that its dietary supplement products are safe before they are marketed. Regulation of supplements varies widely by country. In the United States, a dietary supplement is defined under the Dietary Supplement Health and Education Act of 1994. There is no FDA approval process for dietary supplements, and no requirement that manufacturers prove the safety or efficacy of supplements introduced before 1994. The Food and Drug Administration must rely on its Adverse Event Reporting System to monitor adverse events that occur with supplements. In 2007, the US Code of Federal Regulations (CFR) Title 21, part III took effect, regulating Good Manufacturing Practices (GMPs) in the manufacturing, packaging, labeling, or holding operations for dietary supplements. Even though product registration is not required, these regulations mandate production and quality control standards (including testing for identity, purity and adulterations) for dietary supplements. In the European Union, the Food Supplements Directive requires that only those supplements that have been proven safe can be sold without a prescription. For most vitamins, pharmacopoeial standards have been established. In the United States, the United States Pharmacopeia (USP) sets standards for the most commonly used vitamins and preparations thereof. Likewise, monographs of the European Pharmacopoeia (Ph.Eur.) regulate aspects of identity and purity for vitamins on the European market. There are other missing B vitamins which were reclassified or determined not to be vitamins. For example, B9 is folic acid and five of the folates are in the range B11 through B16, forms of other vitamins already discovered, not required as a nutrient by the entire population (like B10, PABA for internal use), biologically inactive, toxic, or with unclassifiable effects in humans, or not generally recognised as vitamins by science, such as the highest-numbered, which some naturopath practitioners call B21 and B22. There are also nine lettered B complex vitamins (e.g., Bm). There are other D vitamins now recognised as other substances, which some sources of the same type number up to D7. The controversial cancer treatment laetrile was at one point lettered as vitamin B17. There appears to be no consensus on any vitamins Q, R, T, V, W, X, Y or Z, nor are there substances officially designated as vitamins N or I, although the latter may have been another form of one of the other vitamins or a known and named nutrient of another type. The value of eating certain foods to maintain health was recognized long before vitamins were identified. The ancient Egyptians knew that feeding liver to a person may help with night blindness, an illness now known to be caused by a vitamin A deficiency. The advancement of ocean voyages during the Renaissance resulted in prolonged periods without access to fresh fruits and vegetables, and made illnesses from vitamin deficiency common among ships' crews. During the late 18th and early 19th centuries, the use of deprivation studies allowed scientists to isolate and identify a number of vitamins. Lipid from fish oil was used to cure rickets in rats, and the fat-soluble nutrient was called "antirachitic A". Thus, the first "vitamin" bioactivity ever isolated, which cured rickets, was initially called "vitamin A"; however, the bioactivity of this compound is now called vitamin D. In 1881, Russian medical doctor Nikolai I. Lunin [ru] studied the effects of scurvy at the University of Tartu. He fed mice an artificial mixture of all the separate constituents of milk known at that time, namely the proteins, fats, carbohydrates, and salts. The mice that received only the individual constituents died, while the mice fed by milk itself developed normally. He made a conclusion that "a natural food such as milk must therefore contain, besides these known principal ingredients, small quantities of unknown substances essential to life." However, his conclusions were rejected by his advisor, Gustav von Bunge. A similar result by Cornelius Pekelharing appeared in a Dutch medical journal in 1905, but it was not widely reported. In East Asia, where polished white rice was the common staple food of the middle class, beriberi resulting from lack of vitamin B1 was endemic. In 1884, Takaki Kanehiro, a British-trained medical doctor of the Imperial Japanese Navy, observed that beriberi was endemic among low-ranking crew who often ate nothing but rice, but not among officers who consumed a Western-style diet. With the support of the Japanese navy, he experimented using crews of two battleships; one crew was fed only white rice, while the other was fed a diet of meat, fish, barley, rice, and beans. The group that ate only white rice documented 161 crew members with beriberi and 25 deaths, while the latter group had only 14 cases of beriberi and no deaths. This convinced Takaki and the Japanese Navy that diet was the cause of beriberi, but they mistakenly believed that sufficient amounts of protein prevented it. That diseases could result from some dietary deficiencies was further investigated by Christiaan Eijkman, who in 1897 discovered that feeding unpolished rice instead of the polished variety to chickens helped to prevent beriberi in the chickens. 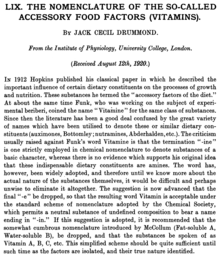 The following year, Frederick Hopkins postulated that some foods contained "accessory factors" — in addition to proteins, carbohydrates, fats etc. — that are necessary for the functions of the human body. Hopkins and Eijkman were awarded the Nobel Prize for Physiology or Medicine in 1929 for their discoveries. In 1938, Richard Kuhn was awarded the Nobel Prize in Chemistry for his work on carotenoids and vitamins, specifically B2 and B6. Once discovered, vitamins were actively promoted in articles and advertisements in McCall's, Good Housekeeping, and other media outlets. Marketers enthusiastically promoted cod-liver oil, a source of Vitamin D, as "bottled sunshine", and bananas as a “natural vitality food". They promoted foods such as yeast cakes, a source of B vitamins, on the basis of scientifically-determined nutritional value, rather than taste or appearance. World War II researchers focused on the need to ensure adequate nutrition, especially in processed foods. Robert W. Yoder is credited with first using the term vitamania, in 1942, to describe the appeal of relying on nutritional supplements rather than on obtaining vitamins from a varied diet of foods. The continuing preoccupation with a healthy lifestyle has led to an obsessive consumption of additives the beneficial effects of which are questionable. The term vitamin was derived from "vitamine", a compound word coined in 1912 by the Polish biochemist Casimir Funk when working at the Lister Institute of Preventive Medicine. The name is from vital and amine, meaning amine of life, because it was suggested in 1912 that the organic micronutrient food factors that prevent beriberi and perhaps other similar dietary-deficiency diseases might be chemical amines. This was true of thiamine, but after it was found that other such micronutrients were not amines the word was shortened to vitamin in English. ^ a b Bender DA (2003). Nutritional biochemistry of the vitamins. Cambridge, U.K.: Cambridge University Press. ISBN 978-0-521-80388-5. ^ a b "Food Fortification Initiative". Food Fortification Initiative, Enhancing Grains for Better Lives. Retrieved 18 August 2018. ^ a b Wilson RD, Wilson RD, Audibert F, Brock JA, Carroll J, Cartier L, et al. (June 2015). "Pre-conception Folic Acid and Multivitamin Supplementation for the Primary and Secondary Prevention of Neural Tube Defects and Other Folic Acid-Sensitive Congenital Anomalies". Journal of Obstetrics and Gynaecology Canada. 37 (6): 534–52. doi:10.1016/s1701-2163(15)30230-9. PMID 26334606. ^ a b Fortmann SP, Burda BU, Senger CA, Lin JS, Whitlock EP (2013). "Vitamin and mineral supplements in the primary prevention of cardiovascular disease and cancer: An updated systematic evidence review for the U.S. Preventive Services Task Force". Annals of Internal Medicine. 159 (12): 824–834. doi:10.7326/0003-4819-159-12-201312170-00729. PMID 24217421. ^ Combs GF (30 October 2007). The Vitamins. Elsevier. ISBN 9780080561301. ^ a b "Vitamin A: Fact Sheet for Health Professionals". National Institute of Health: Office of Dietary Supplements. 5 June 2013. Retrieved 3 August 2013. ^ Hardman, J.G. ; et al., eds. (2001). Goodman and Gilman's Pharmacological Basis of Therapeutics (10th ed.). p. 992. ISBN 978-0071354691. ^ "Pantothenic acid, dexpanthenol: MedlinePlus Supplements". MedlinePlus. Retrieved 5 October 2009. ^ Vitamin and Mineral Supplement Fact Sheets Vitamin B6. Dietary-supplements.info.nih.gov (15 September 2011). Retrieved on 2013-08-03. ^ Gaby AR (2005). 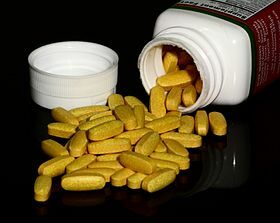 "Does vitamin E cause congestive heart failure? (Literature Review & Commentary)". Townsend Letter for Doctors and Patients. Archived from the original on 10 September 2016. ^ Rohde LE, de Assis MC, Rabelo ER (January 2007). "Dietary vitamin K intake and anticoagulation in elderly patients". Current Opinion in Clinical Nutrition and Metabolic Care. 10 (1): 120–124. doi:10.1097/MCO.0b013e328011c46c. PMID 17143047. ^ Fukuwatari T, Shibata K (June 2008). "Urinary water-soluble vitamins and their metabolite contents as nutritional markers for evaluating vitamin intakes in young Japanese women". Journal of Nutritional Science and Vitaminology. 54 (3): 223–9. doi:10.3177/jnsv.54.223. PMID 18635909. ^ Bellows L, Moore R. "Water-Soluble Vitamins". Colorado State University. Retrieved 7 December 2008. ^ Maqbool A, Stallings VA (November 2008). "Update on fat-soluble vitamins in cystic fibrosis". Current Opinion in Pulmonary Medicine. 14 (6): 574–81. doi:10.1097/MCP.0b013e3283136787. PMID 18812835. ^ Roth KS (September 1981). "Biotin in clinical medicine--a review". The American Journal of Clinical Nutrition. 34 (9): 1967–74. doi:10.1093/ajcn/34.9.1967. PMID 6116428. ^ Rindi G, Perri V (July 1961). "Uptake of pyrithiamine by tissue of rats". The Biochemical Journal. 80 (1): 214–6. doi:10.1042/bj0800214. PMC 1243973. PMID 13741739. ^ Institute of Medicine (1998). "Niacin". Dietary Reference Intakes for Thiamin, Riboflavin, Niacin, Vitamin B6, Folate, Vitamin B12, Pantothenic Acid, Biotin, and Choline. Washington, DC: The National Academies Press. pp. 123–149. ISBN 978-0-309-06554-2. Retrieved 29 August 2018. ^ Pemberton J (2006). "Medical experiments carried out in Sheffield on conscientious objectors to military service during the 1939-45 war". International Journal of Epidemiology. 35 (3): 556–558. doi:10.1093/ije/dyl020. PMID 16510534. ^ a b Bailey RL, Fulgoni VL, Keast DR, Dwyer JT (May 2012). "Examination of vitamin intakes among US adults by dietary supplement use". J Acad Nutr Diet. 112 (5): 657–663.e4. doi:10.1016/j.jand.2012.01.026. PMC 3593649. PMID 22709770. ^ a b c d e Wendt D (2015). "Packed full of questions: Who benefits from dietary supplements?". Distillations Magazine. 1 (3): 41–45. Retrieved 22 March 2018. ^ a b c Price C (2015). Vitamania: Our obsessive quest for nutritional perfection. Penguin Press. ISBN 978-1594205040. ^ Lakhan SE, Vieira KF (2008). "Nutritional therapies for mental disorders". Nutrition Journal. 7: 2. doi:10.1186/1475-2891-7-2. PMC 2248201. PMID 18208598. ^ Boy E, Mannar V, Pandav C, de Benoist B, Viteri F, Fontaine O, Hotz C (2009). "Achievements, challenges, and promising new approaches in vitamin and mineral deficiency control". Nutrition Reviews. 67 Suppl 1 (Suppl 1): S24–S30. doi:10.1111/j.1753-4887.2009.00155.x. PMID 19453674. ^ Gummin DD, Mowry JB, Spyker DA, Brooks DE, Fraser MO, Banner W (2017). "2016 Annual Report of the American Association of Poison Control Centers' National Poison Data System (NPDS): 34th Annual Report" (PDF). Clinical Toxicology. 55 (10): 1072–1254. doi:10.1080/15563650.2017.1388087. PMID 29185815. ^ Comparison of Vitamin Levels in Raw Foods vs. Cooked Foods. Beyondveg.com. Retrieved on 3 August 2013. ^ Effects of Cooking on Vitamins (Table). Beyondveg.com. Retrieved on 3 August 2013. ^ Dietary Reference Intakes: The Essential Guide to Nutrient Requirements, published by the Institute of Medicine's Food and Nutrition Board, currently available online at "DRI Reports". Archived from the original on 5 July 2014. Retrieved 14 July 2014. ^ a b Moyer VA (2014). "Vitamin, mineral, and multivitamin supplements for the primary prevention of cardiovascular disease and cancer: U.S. Preventive services Task Force recommendation statement". Annals of Internal Medicine. 160 (8): 558–564. doi:10.7326/M14-0198. PMID 24566474. ^ Jenkins DJ, Spence JD, Giovannucci EL, Kim YI, Josse R, Vieth R, et al. (2018). "Supplemental Vitamins and Minerals for CVD Prevention and Treatment". Journal of the American College of Cardiology. 71 (22): 2570–2584. doi:10.1016/j.jacc.2018.04.020. PMID 29852980. ^ Bjelakovic G, Nikolova D, Gluud LL, Simonetti RG, Gluud C (2007). "Mortality in randomized trials of antioxidant supplements for primary and secondary prevention: systematic review and meta-analysis". JAMA. 297 (8): 842–857. doi:10.1001/jama.297.8.842. PMID 17327526. ^ Zhao JG, Zeng XT, Wang J, Liu L (2017). "Association Between Calcium or Vitamin D Supplementation and Fracture Incidence in Community-Dwelling Older Adults: A Systematic Review and Meta-analysis". JAMA. 318 (24): 2466–2482. doi:10.1001/jama.2017.19344. PMC 5820727. PMID 29279934. ^ a b Use and Safety of Dietary Supplements NIH office of Dietary Supplements. ^ Legislation. Fda.gov (15 September 2009). Retrieved on 2010-11-12. ^ "Adverse Event Reporting System (AERS)". FDA. 20 August 2009. Retrieved 12 November 2010. ^ U.S. Food and Drug Administration. CFR – Code of Federal Regulations Title 21. Retrieved 16 February 2014. ^ not EUR-Lex – 32002L0046 – EN. Eur-lex.europa.eu. Retrieved on 12 November 2010. ^ a b Bennett D. "Every Vitamin Page" (PDF). All Vitamins and Pseudo-Vitamins. ^ García González JA (December 1979). "[Mother-child relations]". Nueva Enfermeria. 327 (7): 15–20. doi:10.1136/bmj.327.7424.0-h. PMC 261797. ^ "Vitamins and minerals – names and facts". pubquizhelp.34sp.com. Archived from the original on 4 July 2007. ^ a b "B Vitamins". NeuroSoup. 15 April 2013. Archived from the original on 3 March 2016. ^ McDowell LR (2012). Vitamins in Animal Nutrition: Comparative Aspects to Human Nutrition. Elsevier. p. 398. ISBN 9780323139045. ^ a b Gratzer W (2006). "9. The quarry run to earth". Terrors of the table: the curious history of nutrition. Oxford: Oxford University Press. ISBN 978-0199205639. Retrieved 5 November 2015. ^ a b Rosenfeld L (1997). "Vitamine—vitamin. The early years of discovery". Clinical Chemistry. 43 (4): 680–685. PMID 9105273. ^ a b Carpenter K (22 June 2004). "The Nobel Prize and the Discovery of Vitamins". Nobelprize.org. Retrieved 5 October 2009. ^ "Paul Karrer-Biographical". Nobelprize.org. Retrieved 8 January 2013. ^ "The Nobel Prize in Chemistry 1938". Nobelprize.org. Retrieved 5 July 2018. ^ Price C (Fall 2015). "The healing power of compressed yeast". Distillations Magazine. 1 (3): 17–23. Retrieved 20 March 2018. ^ Iłowiecki M (1981). Dzieje nauki polskiej. Warszawa: Wydawnictwo Interpress. p. 177. ISBN 978-83-223-1876-8.